Ryanair has lowered its profit guidance for the year. It expects profits of between €1.0bn and €1.1bn, down from its previous range of between €1.1bn - €1.2bn. Chief executive Michael O'Leary blamed lower than expected air fares, saying that there is too much capacity in the short haul European air market this winter. "We cannot rule out further cuts to air fares and/or slightly lower full year guidance if there are unexpected Brexit or security developments which adversely impact yields between now and the end of March," he said. "We believe this lower fare environment will continue to shake out more loss making competitors, with WOW, Flybe, and reportedly Germania for example, all currently for sale," he added. Responding to reports that Germany is considering banning telecoms equipment made by Huawei in its next generation its 5G network, the Chinese firm says: "Huawei sees no rational reason why it should be excluded from building 5G infrastructure in Germany, or indeed in any country in the world. "We share the German Federal Government’s commitment to ensuring secure ICT [information and communications technology] infrastructure and we have made significant contributions to delivering this goal. "We welcome the principle of standardisation and verification tabled by the German Government and our security laboratory, opened in Bonn in 2018, is designed to support this objective." A new way forward for nuclear? One proposal to help fund the construction of nuclear power plants in the UK is the so-called regulated asset base (RAB) model, under which consumers effectively pay up front. Emma Haight-Cheng, head of infrastructure debt Europe, at AMP Capital, says: "The RAB model is certainly not unusual. "It is used to finance large infrastructure projects, typically where there is a monopoly in place. So it used in order to do a number of things: firstly and foremost it tends to be for monopolistic projects so it is used to protect the consumer." Though she concedes it is yet to be used to finance a major nuclear project. Hitachi confirmed on Thursday that it will suspend construction of a power plant at Wylfa Newydd in north Wales, dealing yet another blow to the UK's struggling nuclear industry. Commenting on why building nuclear plants in the UK it is proving so difficult Emma Haight-Cheng, an infrastructure analyst, at AMP Capital tells the Today programme: "Another complication which is added with that kind of project is the fact that you have a number of different contracts during the construction stage because a lot of different types of expertise are required to build that type of plant. "So you have the contract, the interface risk between different contracts, and it is therefore very difficult to place the risk with one party." Nissan and Mitsubishi have announced that an investigation into the companies' former chairman Carlos Ghosn confirms claims that he allegedly received €7.8m (£6.8m) in "improper payments" from a joint venture between the two firms. The Japanese carmakers said Mr Ghosn, who was arrested in Tokyo on 19 November, entered into a personal employment contract with Nissan-Mitsubishi BV (NMBV) "without any discussion with the other board members". The investigation also claims that following the decision by Nissan and Mitsubishi to form the alliance in 2016, "Ghosn, former representative director Greg Kelly and others began to explore the possibility of paying undisclosed compensation to Ghosn through an equally-owned Netherlands-based unconsolidated joint venture between the companies". Mr Kelly has also been arrested and like Mr Ghosn, remains in detention. Both men deny the claims. Nissan said: "Nissan views the payments Ghosn received from NMBV to be the result of misconduct, and will consider measures to recover from Ghosn the full sum." Credit card borrowing will fall to the lowest level since 2007 in the first quarter of this year, the Guardian reports in its business section. It quotes Bank of England data, which also showed demand for mortgage lending also dropping significantly. US President Donald Trump has cancelled a trip by a high-level US delegation to next week's World Economic Forum at the Swiss mountain resort of Davos, citing the ongoing government shutdown in America. Press secretary Sarah Sanders said in a statement the trip was axed "out of consideration for the 800,000 great American workers not receiving pay and to ensure his team can assist as needed." China has revised its final 2017 GDP reading down from 6.9% to 6.8%. It comes ahead of Monday's release of growth figures for the last quarter of 2018. Those figures are expected the world's second largest economy is slowing down. Analysts polled by Reuters forecast China grew 6.4% in the three months to December, down from 6.5% in the previous quarter. 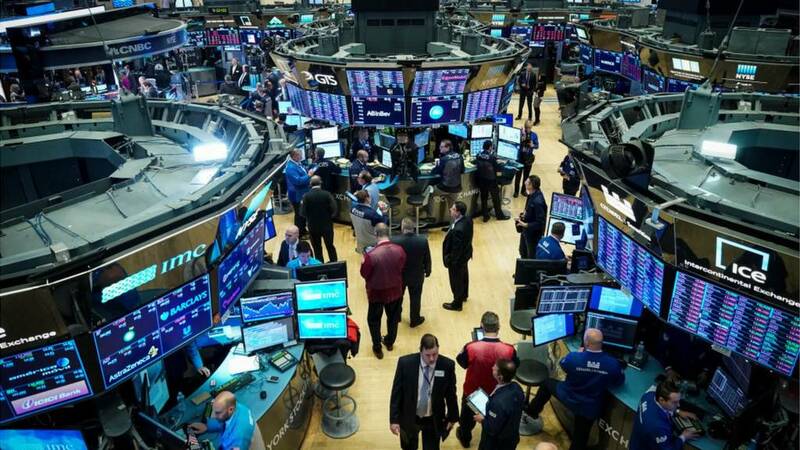 Asian stocks rose on Friday, after a Wall Street Journal report that U.S. officials are debating dialling back tariffs on Chinese imports lifted stock markets generally. In China, Hong Kong's Hang Seng index was 1% higher at 27,031.58, while the Shanghai Composite was up 0.9% at 2,581.94..
Japan's benchmark Nikkei 225 was 1.3% higher on the day. Netflix ended 2018 with more than 139 million paid subscribers - adding 8.8 million members in the three months to 31 December. In its quarterly earnings update, the streaming giant said the growth reflected the success of its original programmes, such as Bird Box and Roma. Executives say original material now represents the "vast majority" of its most popular shows. Germany is considering ways to block Huawei from its next generation mobile phone network, according to media reports. Berlin is exploring stricter security requirements which may prevent Huawei products being used in its 5G network, the reports said. There could more trouble for Chinese tech firm Huawei - Germany is reportedly considering ways to exclude it from the next generation of mobile phone networks. Overnight there were bumper results from Netflix. And later this morning we'll receive official UK retail sales figures for December.